It was a banner year for Los Angeles cookbooks. Among the 2017 greatest hits: Wes Avila’s Guerrilla Tacos: Recipes from the Streets of L.A., Jeremy Fox’s On Vegetables, Nguyen Tran’s Adventures in Starry Kitchen, Josef Centeno’s Bäco: Vivid Recipes from the Heart of Los Angeles, Kris Yenbamroong’s Night + Market: Delicious Thai Food to Facilitate Drinking and Fun-Having Amongst Friends and Adele Yellin and Kevin West’s The Grand Central Market Cookbook. The above titles are all fantastic and compelling reads to be sure (note: as the co-author of Night + Market, I might be slightly biased about that one) however, there was one tome in particular that felt not only relevant to the city’s cultural canon, but urgently overdue: Bill Esparza’s L.A. Mexicano: Recipes, People & Places, a collection of stories and profiles chronicling Mexican food culture across Los Angeles. It’s worth mentioning that Esparza, an L.A.-based food writer and media consultant, won a 2016 James Beard Foundation Award alongside former Los Angeles food editor Lesley Bargar Suter for their coverage of L.A.’s taco scene in this very magazine, although we can hardly claim him as this magazine’s own. He’s spent more than a decade covering the city’s Latin-American food scene on his blog as well for outlets like Eater L.A., KCRW’s Good Food, and CNN. 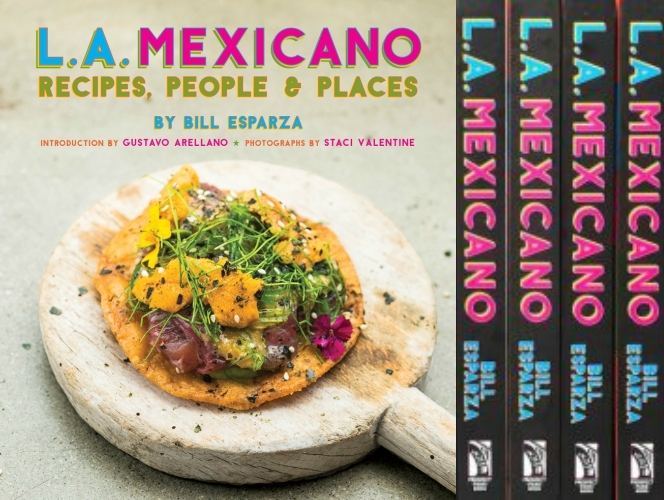 The idea for L.A. Mexicano, which in some ways is a culmination of the type of coverage Esparza has been doing for years, came from Prospect Park Books editor Colleen Dunn Bates, who had long wanted to publish a cookbook detailing the dynamic foodways of Mexican cooking in Los Angeles. Filled with 40 profiles of chefs, bakers, restaurateurs, street vendors, and other culinary artisans, the book offers insight that spans generations. Many names you might recognize—Ray Garcia, Rocio Camacho, Carlos Salgado—but even more fascinating are interviews (and recipes) from the families behind such civic institutions as Cielito Lindo on Olvera Street (open since 1934), El Tepeyac Café, and Casa Vega. Another important aspect of L.A. Mexicano is that it demolishes the idea of regional Mexican cooking as a somewhat recent phenomenon in Los Angeles, revealing instead a nuanced ethnographic saga often obscured by the city’s long and pervasive history of white-washing, appropriating, and otherwise diminishing the importance of Mexican-Americans in shaping Southern California food culture. A blend of past, present, and future (including an in-depth look at the rising Alta California culinary movement currently taking the city by storm), L.A. Mexicano is a welcome deep dive into the people and places that have defined our city’s lasting love affair with tacos, burritos, tamales, and countless other dishes. The fact that you can also cook the iconic recipes from those same storied establishments (like Mariscos Jalisco’s fiery aguachile rojo) is icing on the cake.